1. The plaid skinny tie is an accessory that is never lacking in personality and classic style. With just a slight nod to traditional vintage patterns, and an undoubtedly modern update with its slim shape, this skinny tie is unlike the rest. It exudes a sense of appreciation for tradition while embracing the present. For the man that is unafraid of pattern and loves to sport his own unique style, this tie is an easy choice to add to a wardrobe. 2. This pattern finds its roots in Gaelic Scotland, originally being a unique regional identifier. Defined by its iconic pattern of criss crossing lines in various colors and styles, called a sett, this pattern is highly distinctive and has become associated with Scottish culture and has become a staple for winter flannels and blankets. 3.We've taken this traditional pattern and made it a universal classic, with plaid and tartan being used for furniture, clothing, stationery and accessories alike. Plaid has become a defining and on-trend pattern through time that carries an undeniable sense of style and sophistication. 5. Gingham is a pattern so versatile; it's as popular for Western cowboy apparel as it is for East Coast preppy styles. This iconic tie style can be seen today on women's fashion runways, too. We have men's clip-on gingham ties and boy's prep self-tie bowties. Our gingham bow ties are available in classic self-tie bowtie styles, pre-tied banded bow ties and convenient pre-tied clip-on bowtie styles. 6. To keep within the seasonal trend, check out our awesome selection of checks skinny ties for a warm and cozy staple that's perfect for spring, sunmmer, fall and winter. Classic Length: 146cm (57") Width: 3.15" (8cm) at widest, 100% microfiber woven and 1200 stitches to make sure our tie stand in a durable quality and perfect performance in your daily dress. Plaid and stripe ties are a great choice for business casual and less formal occasions, such as daily work wear, parties, office events, dinner dates, and simple day to day activities. Plaid ties look fantastic with a brown blazer in the winter or Seersucker jacket in the summer. Not a fan of bright pink or orange neckties, but still like to wear a fresh hued to for the coming spring and summer season? Then this sky blue colored tie will be perfect. Strike a fashionable balance between traditional patterns and innovative color palettes with this sophisticated tie in soft tonal blues, reds and silvers. 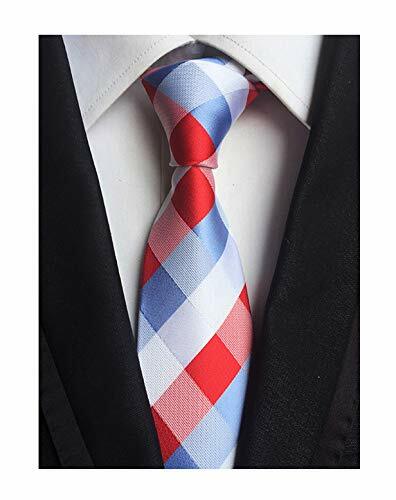 While mostly check in blue color, it is the delicate fabric weave of tiny checks that makes this tie stand out from the all-too-common solid neckties. The textile shimmers and glistens with intricate, handwoven details. Add a touch of softness to your powerhouse navy suits and business sports coats. We suggest pairing this invigorating tie with a micro-check dress shirt, a double breasted navy blue suit and a soft blue handkerchief.